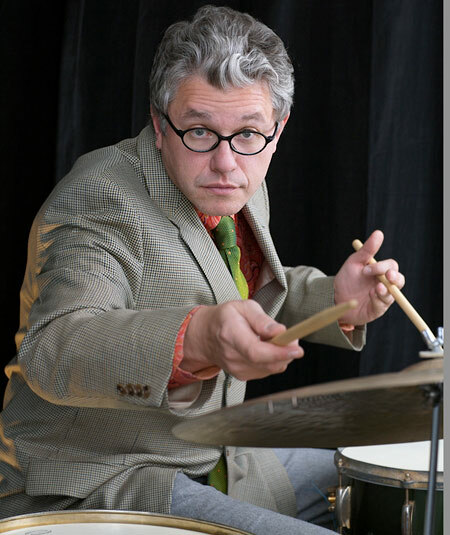 The charismatic drummer is a big-picture guy, with dissonance and beauty, melody and abstraction, and whimsy and introspection, strolling hand in hand across his music. Dispensing myriad emotions is the goal, and this trumpet/key outfit is one of his most agile bands. On An Attitude For Gratitude they veer through a Scofield Cubano-bop, turn in a bittersweet “Happy Days Are Here Again,” and connect the existential dots between bubbles and rainbows. This is the perfect room for them. Team Schatz invited a wealth of improvisers to engage in short bits of creativity Monday night at (Le) Poisson Rouge. It was a fundraiser for a Kickstarter project that’s also wonderfully creative. Here are some the show’s highlights. The guitarist used one of his tiniest instruments for the 10-minute performance, and his plucking was genteel throughout. But for a moment, he went for a kind of picking action that took the ethereality to another level, strumming the strings with a dangle of his dreads. Christian McBride had already coaxed some swing out of Avishai Cohen when it came time for the next participant to set up shop. That was M@ Wilson and his patented frolic. The high-flying nature of their exchange pushed the bassist to dance up and down the fingerboard. The quicker his hands moved, the more articulate he sounded. Wilson pushed and pushed and pushed. Ralph Alessi was deep into an enticing abstract ramble that was being supported by DJ Logic’s back beats. But the vocalist’s arrival ferried the music to another place. Arriving with a plunger mute, he became a human trombone, growling and mewling with enough whimsy to conjure a Tuvan throat singer. There was a little David Moss and Phil Minton in the air. Setting up shop at the wheels of steel, the downtown doyen fed his mate M@ Wilson a big dollop of everything. “Hang On Sloopy” got some laffs, but the segue between the ’60s-style high school birds and bees lesson (“the testicles are in a pouch outside the body”) and the Malcolm X-like fillosofizing became the sweet spot, although making Steve Bernstein play along with Sonny & Cher’s faux gypsy horns on “Bang Bang” a few minutes later was also a kick. The trombonist is wonderfully versatile. His first string of solo notes – coming off of a whispered exchange with Don Byron – felt like a cellist had taken the stage. The evening’s closer, Roseman chose a muted approach and kept inching his way towards a melody he was in the process of clarifying. Great goodbye maneuver, fetching for sure, delicate and deep.